We're so grateful you voted our "Kitty Nights Burlesque" series BEST BURLESQUE SHOW again this year in The Georgia Straight's #BestOfVan! Click any image for details and pricing. 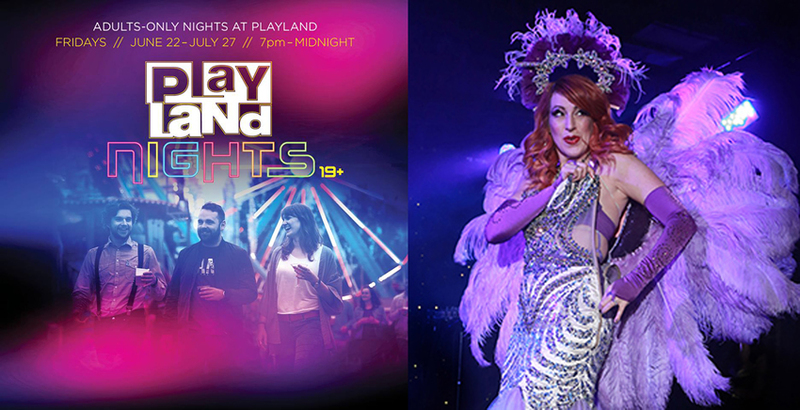 Playland Nights at The PNE, Cascades Casino, Edgewater Casino, Vancouver FanClub, MOSAIC, ONNI, Sears, Pret A Pour Nuit, The Osoyoos Arts Council, The Royal Vancouver Yacht Club, The STAGE in Mission, Monte Carlo Nights, The Rio Theatre, The Biltmore Cabaret, S.P.A.C.E., IATSE and many more. This summer we were thrilled to bring vintage burlesque glamour to PLAYLAND NIGHTS at The PNE! Thanks to everyone who came out to the shows and shared the fun! Our public shows have won the hearts of Vancouver audiences, garnering us the awards of the 2015, 2016, 2017 AND 2018 Georgia Straight Award for Vancouver's BEST BURLESQUE SHOW. Since 2008, our Profesional Division has been providing Vancouver, BC (and beyond) with quality, competitively priced professional entertainment with retro style! From a few costumed entertainers to full stage shows, to female empowerment seminars, we've added extra sparkle to private parties, corporate functions, retirement homes, and more. For more press please click HERE. SUBSCRIBE TO OUR FACEBOOK EVENTS AND NEVER MISS OUT ON THE FUN!